“From the heart of the south, Georgia, emerges the band Liquid. They are ready to take on Atlanta, the United States, and the world as the NEW power pop/rock band. The Liquid mission; to take you on a ride. All the elements of this band are torqued and tuned to precise specifications to perform at the highest level in EVERY category. Rock laced with Pop and sharp, clever lyrics is what to expect when you listen to LiQuiD. Enough Rock to please the Rockers and enough Pop to entertain the Poppers. There are hints of old-school Rock, but this isn’t your Dad’s Rock. This is modern, in your face, simmered and served Pop Rock that will get your toes tapping and your heart pumping. 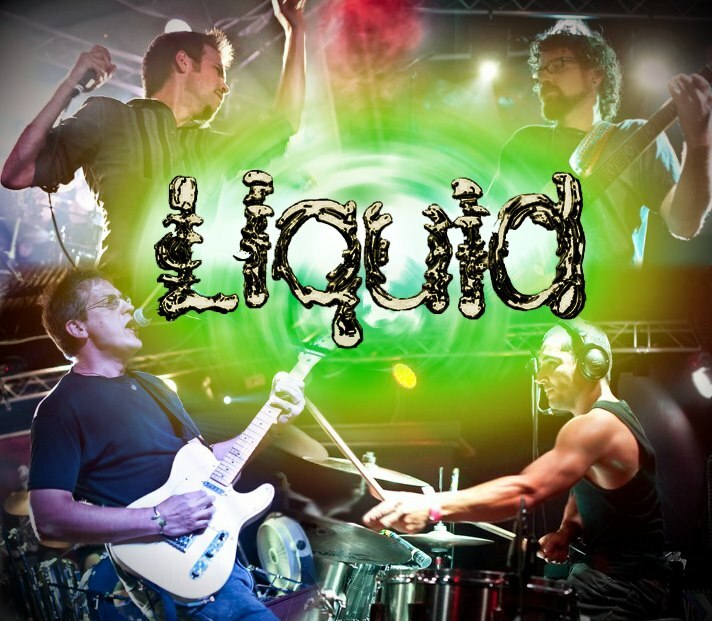 LiQuiD’s album is a breath of fresh air in the over-saturated Pop/Rock scene. They are very much unlike anything else you have ever heard thanks to their unique and uncanny mix of genres. It’s not uncommon for Pop and Rock to mix together. Hell, they’re almost like peanut butter and jelly. A lot of times, they just go together. The problem is, however, that even as delicious as PB&J is, it can get old. You still want a PB&J sandwich, but you switch it up and go with chunky peanut butter or maybe a different kind of jelly. LiQuiD is either the chunky peanut butter or new flavored jelly (depending on your preference). The point of that long-winded and seemingly pointless story is that LiQuiD is powerfully unique. I was thinking about doing a track by track breakdown, but that would end up being a pretty long read for you all. Also, it would take away one of the best parts of discovering new music – the surprise. Listening to music you know is going to be good is like opening presents on Christmas. If someone tells you what you’re getting, it kind of spoils the whole thing. So I’ll just key on the three songs off LiQuiD’s self-titled, debut album that really jumped out at me and quickly forced me to listen to them multiple times. In the music biz, we call those “hits”. “Eddie Are You All Right?” is a Rock song with a bit of an old-time guitar sound fused with a modern feel. This song was strong from top to bottom – vocals, lyrics, melody, harmony – you name it, it was done to perfection. “Eddie Are You All Right?” has a lot about it that I liked, specifically, the vocals. They had a neat effect to them that made the vocals absolutely pop in the song and were easily the focal point for me. This was hands down my favorite song off the album. As with many of the songs on LiQuiD’s debut album, there was some excellent harmony in the song. With the addition of some synth sounds, the song took on a whole new level of awesome. “New” has a nice Pop sound to it with an excellent modern Rock overlay. Almost has a Radiohead – Karma Police type feel to it. Which is incredibly odd, because the songs sound nothing alike, but I still got that type of vibe. It’s soft, then loud. Despite it’s high-charged chorus, the song flows easily and seamlessly from a building intensity to release a number of different times, like a rollercoaster going up and downhill. This was a deep song, from my perspective, anyway. Perhaps I read into it a bit too much, but it left me intrigued. “New” is passionate, strong, and beautifully powerful. Call the CDC, “It’s What We Do” is catchy as a rash! It’s also a fantastic dance song. I don’t dance (at least not well), but even I was doing my best dancing-while-sitting-in-a-chair dance. I couldn’t help it. I challenge you to listen and not, at the very least, do the chair-dance. “It’s What We Do” has a very exciting guitar solo around the midpoint of the song that you need to check out. There’s also some kind of techno, grumbly, growly voice towards the end, right before the “woot woot” that I was a big fan of. This song is a must-play at any party you throw. Another song I really liked was “It’s Not Over“, so be sure to check that one out as well. As always, feel free to explore LiQuiD to much greater depths by taking advantage of the linkage below. Also, be sure to share this awesome find with your friends so that they may partake in the wonder that is LiQuiD! What was your favorite song off LiQuiD’s debut album? Let me know in the comments – Enjoy!